This is a continuation of This Post, a written version of a talk I gave at church. Women of faith express desperate prayer. Rahab was in a terrible situation. Stuck there between the walls of Jericho, waiting for a God she’d just met to rescue her. She must have paced those stone floors, wondering if she’d done the right thing and desperate to know how this would all turn out. We know that Rahab had been a pagan and the Bible does not say how or even if she prayed. For all we know, she may have responded to her plight by going next door and sacrificing the neighbor’s cat! I’d like to think, though, that she responded by reaching out to the God she’d chosen to put her hope in, that she prayed and cried out to Him in her desperate situation. Do you remember that first prayer you prayed? Maybe a prayer cried out to God in despair, asking Him to show Himself, to move in a way that you can see Him, know His presence. When we pray this way, when we cry out to him and place it all in His hands, trust Him with our deepest needs…God responds. Sometimes we don’t get what we’re desperate for, we just get the strength to go on despite that. But this sort of prayer blesses us in that it draws us closer to a loving Father who longs to comfort us, to hold us close. How can you renew your prayer life? Even when things are going well in our lives, we still need God desperately. We can pray for other desperate needs, for the nations, for those in our lives who are suffering, for the needs of those who can’t (or won’t!) pray themselves. We can pray that God will help us learn to seek him with all our hearts, in all situations. Women of faith keep their promises. Rahab had great faith! We often think of people who have great faith as people who are doing amazing things….David slaying Goliath, Abraham walking up that dusty hill to sacrifice his son Issac, a family selling everything they own to go to some inhospitable place and share the Good News. In Rahab’s case, she made a simple promise that she would not give away the spies she’d just met. In return, she was told that a God she’d just met through a people she’d only heard stories about (and you can bet they weren’t warm, fuzzy stories!) would rescue her and her family from a coming disaster. All Rahab needed to do was tie a simple scarlet cord in her window and wait for deliverance. Remember the Israelites in Egypt? How they waited that night, huddled behind doors marked with the crimson blood of perfect lambs, waiting for the angel of death to pass them by? I think of Rahab in the same way, waiting there behind the protection of God’s scarlet mark. Sometimes faith is an army, massing outside of seemingly impossible walls, ready to take action on the conviction of God’s promise. And sometimes faith is a thin, worn scrap of cord dangling, exposed and raveled, against cold stone. Sometimes it takes just as much faith to get up in the morning and let your feet hit the floor as it does to pack your suitcase (and your underwear!) full of Bibles and head to China. But God loves both kinds of faith, He knows where you are and He values your faith no matter how small it may feel. 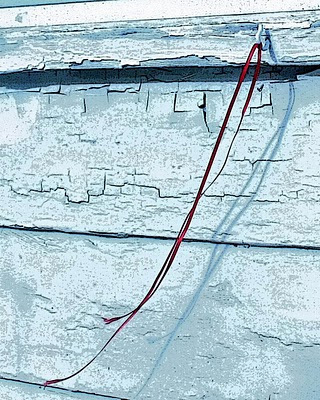 All Rahab did was tie a cord in her window. She took no amazing action beyond tying a knot…something she must have done every day! She was not brave, we know this because she lied to the officials that the king of Jericho sent regarding the spies, rather than boldly speaking the truth (and surely God would have honored that and used it for good). But God knew Rahab’s heart! This simple kind of faith, the barely hanging on by a thread kind of faith, would be greatly rewarded. She kept her promise…however small…in faith, and was saved. How are you doing with keeping promises? Are you experiencing the ‘invading army’ kind of faith right now, or the ‘hanging by a thread’ type? Prayers and promises usually go hand in hand, aye?